In the book of Judith from the Apocrypha, the heroine saves the besieged Jewish city of Bethuliah. She does so by deceiving, and then killing the invading general Holofernes, leading to the defeat of his army. In chapter eight (verses 8-35) Judith tells the ruler and elders of Bethuliah of her intentions, but first she rebukes them for putting God to the test. She encourages them to remain faithful to God who may, in fact, be putting them to the test. And she calls on them to put their trust in God even when they do not understand his ways, arguing that they should not expect to be able to comprehend the almighty God when they cannot even understand another person. There was no one that said an ill word about Judith, for she feared God greatly. But Judith heard the evil words that the people had spoken against the ruler, because their courage failed them for lack of water. And Judith had heard all the words that Uzziah and the elders had spoken unto the people, and that they had sworn to deliver the city unto the Assyrians after five days. And so she asked to speak to the elders. And when they came to her, she said to them, “Hear me now, O elders of the inhabitants of Bethulia, for your words before the people this day are not right. You were wrong to make an oath, pronounced between God and you, promising to deliver the city to our enemies, unless within these five days the Lord turns to help you. Who are you that you should this day put your God to the test? “You want to put the Lord Almighty to the test, but what do you know? You cannot even see into the depths of the heart of a man, nor can you understand his thinking. How, then, do you think you can search out the heart of God who has made man and all things? Can you expect to know what is in God’s mind or comprehend his ways and purposes? No, my brethren, do not provoke the Lord our God to anger. For even if he will not help us within these five days, he still has the power to defend us on any day he so wills it, or, he has the power to destroy us before our enemies even get the chance. Do not attempt to limit the ways of the Lord our God, for God is not like man, that he may be forced to give in to threats. Therefore, let us wait for his salvation, calling upon him to help us. He will hear our voice and help, if it pleases him. “For none of our people in these times, have worshiped gods made with hands, as had been done in ages past. For this reason our fathers were given to the sword, and plundered, and suffered greatly before our enemies. But we know of no other god, therefore we will put our trust in Him, that he will not forsake us. For if we are taken, all Judea shall fall, and our sanctuary will be spoiled, and we will be punished. And the Gentiles will slaughter our brethren, and enslave our country, and desolate our inheritance; and we will be dishonored by the Lord our God. 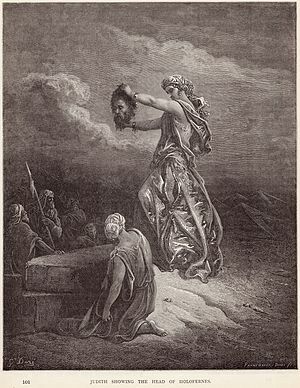 “Judith Showing the Head of Holofernes”, illustration of the Apocryphal Book of Judith, Chapter 14, from Gustave Doré’s (1832-1888) illustrated edition of the Bible. Habakkuk 1:2 — How long, O Lord, must I call for help, but you do not listen? Or cry out to you, “Violence!” but you do not save? Proverbs 3:5-7 — Trust in the Lord with all your heart and lean not on your own understanding; in all your ways acknowledge him, and he will make your paths straight. Do not be wise in your own eyes; fear the Lord and shun evil.